In my fourth compilation of the canine and feline endocrine publications of 2014, I’m moving on to disorders of the feline thyroid gland. Listed below are 32 papers that deal with a variety of thyroid gland topics of issues of clinical importance in cats. These range from from a survey of owners' perceptions and experiences after using radioiodine to treat their hyperthyroid cats (1) to the results of an online survey to determine owner experiences and opinions on the management of their cats using oral anti-thyroid medications (14); from case reports of methimazole or carbimazole-induced toxicity in cats with hyperthyroidism (3,5,19) to a number of publications involving various issues of medical treatment with methimazole (2,4,7,14,15,20); from a study of the concurrent diseases detected in hyperthyroid cats undergoing assessment for radioiodine treatment (25) to concurrent diseases and conditions in cats with renal infarcts (including hyperthyroidism (12); and finally, from studies investigating the efficacy of an iodine-restricted diet for management of cats with hyperthyroidism (9,30) to other forms of dietary management for this endocrine disease (19,24). Finally, 2 investigations add further data concerning chronic renal disease in hyperthyroid cats (31,32), as well as the fact that iatrogenic hypothyroidism contributes to azotemia in these cats (31). A number of 2014 publications deal with the rising prevalence and/or etiopathogenesis of hyperthyroidism in cats (6,16,17,21,22,23,29). Unfortunately, further studies are needed to better define the cause(s) of this perplexing disease (download my review paper for more discussion) (23). Boland LA, Murray JK, Bovens CP, et al. A survey of owners' perceptions and experiences of radioiodine treatment of feline hyperthyroidism in the UK. J Feline Med Surg 2014;16:663-670. Boretti FS, Sieber-Ruckstuhl NS, Schafer S, et al. 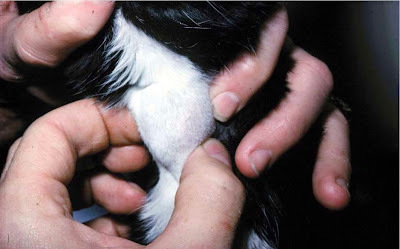 Transdermal application of methimazole in hyperthyroid cats: a long-term follow-up study. J Feline Med Surg 2014;16:453-459. Bowlt K, Cattin I, Stewart J. Carbimazole-associated hypersensitivity vasculitis in a cat. J Small Anim Pract 2014;55:643-647. Bruyette D. Methimazole management of feline hyperthyroidism. Today's Veterinary Practice 2014;July/August:38-41. Castro Lopez J, Lloret A, Ravera I, et al. Pyogranulomatous mural folliculitis in a cat treated with methimazole. J Feline Med Surg 2014;16:527-531. Chow K, Beatty JA, Barrs VR, et al. PBDEs and feline hyperthyroidism. Vet Rec 2014;175:433-434. Daminet S, Kooistra HS, Fracassi F, et al. Best practice for the pharmacological management of hyperthyroid cats with antithyroid drugs. J Small Anim Pract 2014;55:4-13. Daniel GB, Neelis DA. Thyroid scintigraphy in veterinary medicine. Semin Nucl Med 2014;44:24-34. Fritsch DA, Allen TA, Dodd DE, et al. A restricted iodine food reduces circulating thyroxine concentrations in cats with hyperthyroidism. Intern J Appl Res Vet Med 2014;12:24-32. Fryers A, Elwood C. Hypokalaemia in a hyperthyroid domestic shorthair cat with adrenal hyperplasia. J Feline Med Surg 2014;16:853-857. Galgano M, Spalla I, Callegari C, et al. Primary hypothyroidism and thyroid goiter in an adult cat. J Vet Intern Med 2014;28:682-686. Hickey MC, Jandrey K, Farrell KS, et al. Concurrent diseases and conditions in cats with renal infarcts. J Vet Intern Med 2014;28:319-323. Higgs P, Murray JK, Hibbert A. Medical management and monitoring of the hyperthyroid cat: a survey of UK general practitioners. J Feline Med Surg 2014;16:788-795. Hill K, Gieseg M, Bridges J, et al. The pharmacokinetics of methimazole in a novel lipophilic formulation administered transdermally to healthy cats. N Z Vet J 2014;62:208-213. Hill KE, Shaw IC. Does exposure to thyroxine-mimics cause feline thyroid hyperplasia? Vet Rec 2014;175:228-229. Kooistra HS. Feline hyperthyroidism: a common disorder with unknown pathogenesis. Vet Rec 2014;175:456-457. Kujawa A, Olias P, Bottcher A, et al. Thyroid transcription factor-1 is a specific marker of benign but not malignant feline lung tumours. J Comp Pathol 2014;151:19-24. Laflamme D, Gunn-Moore D. Nutrition of aging cats. Vet Clin North Am Small Anim Pract 2014;44:761-774, vi. Mardell EJ. Diagnosis and management of feline hyperthyroidism. In Practice 2014;35:162-170. McLean JL, Lobetti RG, Schoeman JP. Worldwide prevalence and risk factors for feline hyperthyroidism: A review. J S Afr Vet Assoc 2014;85:1097. O'Neill DG, Church DB, McGreevy PD, et al. Prevalence of disorders recorded in cats attending primary-care veterinary practices in England. Vet J 2014;202:286-291. Peterson ME. Feline hyperthyroidism: an animal model for toxic nodular goiter. J Endocrinol 2014;223:T97-T114. Peterson ME, Eirmann L. Dietary management of feline endocrine disease. Vet Clin North Am Small Anim Pract2014;44:775-788. Puig J, Cattin I, Seth M. Concurrent diseases in hyperthyroid cats undergoing assessment prior to radioiodine treatment. J Feline Med Surg 2014. Rasmussen SH, Andersen HH, Kjelgaard-Hansen M. Combined assessment of serum free and total T4 in a general clinical setting seemingly has limited potential in improving diagnostic accuracy of thyroid dysfunction in dogs and cats (Letter). Vet Clin Pathol 2014;43:1-3. Sangster JK, Panciera DL, Abbott JA, et al. Cardiac biomarkers in hyperthyroid cats. J Vet Intern Med 2014;28:465-472. Schober KE, Kent AM, Aeffner F. Tachycardia-induced cardiomyopathy in a cat. Schweiz Arch Tierheilkd 2014;156:133-139. Stephens MJ, Neill DG, Church DB, et al. Feline hyperthyroidism reported in primary-care veterinary practices in England: prevalence, associated factors and spatial distribution. Vet Rec 2014;175:458.
van der Kooij M, Becvarova I, Meyer HP, et al. Effects of an iodine-restricted food on client-owned cats with hyperthyroidism. J Feline Med Surg 2014;16:491-498. Williams TL, Elliott J, Syme HM. Association between urinary vascular endothelial growth factor excretion and chronic kidney disease in hyperthyroid cats. Res Vet Sci 2014;96:436-441.